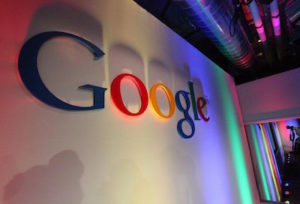 Google’s commercial real estate expansion continues, with plans to invest an additional $13 billion in data centers and offices throughout the U.S. in 2019, according to Globe Street. This comes on top of Google’s previously announced 1.7 MSF Hudson Square office expansion in lower Manhattan. While much of this activity involves moving into newly built or existing space, there also are redevelopment plans in the works, according to Bisnow. The company’s footprint in New York City, for example, is mainly repurposed manufacturing space on Manhattan’s West Side, which included its $2.4 billion purchase of Chelsea Market last year. In Chicago’s skyscraper race, multifamily is outpacing office, as Millennials and others flock downtown. 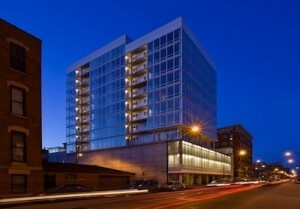 Chicago’s multifamily market continues to reach new heights, quite literally. The city is now one of just a few cities in the U.S. to boast 100 skyscrapers in its skyline, with the addition of Jupiter Realty Co.’s 444-unit apartment building at 465 North Park. 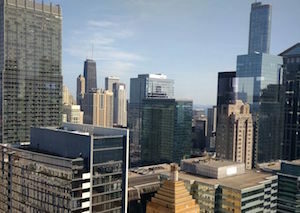 Since 2000, developers have added 38 skyscrapers in Chicago, and 25 of them are multifamily towers, according to a recent Bisnow story. 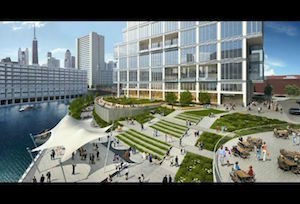 Another seven towers are scheduled to open by 2022, and just one, 110 N. Wacker, is an office building. Demand is high on the multifamily front, with an increase in employment and the “live, work, play” trend that is bringing Millennials and others into the Loop and other city neighborhoods. 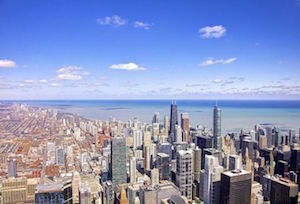 According to a recent report from Real Capital Markets, there is plenty of capital, both domestic and foreign, chasing multifamily investments in Chicago and on a national scale. Among the new developments to watch is Vista Tower, a 406-unit condo development nearing completion along East Wacker Drive and the Chicago River. 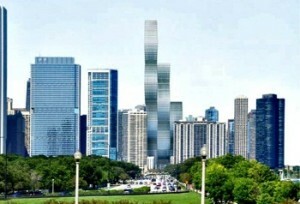 When completed in 2020, it will reach 1,198 feet, surpassing the Aon Center as the city’s third-tallest building. Chicago has a rich history of skyscraper development dating back to the 1960s. Its 1000 Lakeshore Plaza, a 55-story, 590-foot multifamily property was the tallest concrete reinforced building in the world when It was completed in 1964, according to RentCafe. Among the notable multifamily skyscrapers in Chicago are Marina City and Lake Point Tower. But today, American skyscraper development is mainly taking place in New York. Around the world, China is leading the way in skyscraper construction, developing 76 such buildings in 2017. Just 10 were completed in the U.S. in that same year. 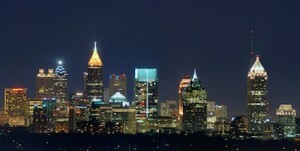 Atlanta is seen as a favorite for Amazon HQ2 given its low cost of living and strong talent pool. The race is still on for the Amazon HQ2 project — a potential $5 billion construction bonanza that would bring 50,000 jobs. 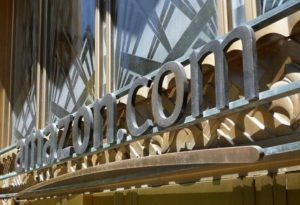 After 238 cities and regions in 54 locations (US and Toronto) submitted bids, Amazon recently announced the short list of 20 cities still in the running. It’s all a sham, as the Washington, D.C. area (which has 3 finalists) has already been chosen, according to a recent Bisnow story. The story points to Amazon founder Jeff Bezos’ new mega-mansion in the area as the critical link to those sites. Executives do like to live near their offices, after all. Others say it could all be a publicity stunt by Amazon. Look at all the good publicity and the scramble by government officials to appease Amazon.com. See more on that at axios.com. This southern city with $5.8M residents is considered a top contender due to its cost of living, strong talent pool and access to the world’s busiest airport. Traffic was cited as one negative issue, however. This is how a Chicago Amazon HQ2 might look. Image from Goettsch Partners. 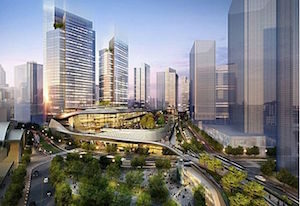 Chicago made the cut and here’s what is pushing the city ahead, according to this Bisnow story. 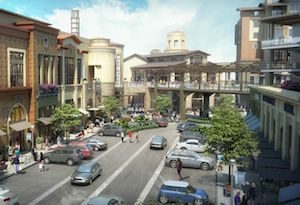 The proposal included 10 sites, many with large land areas for development. From Lincoln Yards to the old Michael Reese Hospital site to 700 W. Chicago (pictured here), the city proposal includes many land masses. The incentives package included about $2B. One frontrunner, according to the story, is the old Chicago Tribune printing plant in River West, as it would connect downtown, River North, the Fulton Market and other neighborhoods. Dallas and Fort Worth are gaining attention for their strong supply of tech talent. And, the cost of living is much lower than other tech hubs, such as New York or San Francisco. Columbus and Nashville are in, but neither has a major airports, which seems like a liability. For a detailed look at which cities made the list — and why — see this money.com story. Real estate and tech talent are key for Amazon in its HQ search. The commercial real estate industry is abuzz as bids were submitted for the hometown of Amazon’s HQ2, a 50,000-employee, $5 billion second headquarters. With more than 50 cities in the U.S. and Canada vying for the company’s attention, competition is fierce, with some cities getting creative to make their case. According to this Bisnow article, Tucson, Arizona, sent Amazon a 21-foot cactus to remind the company of the city’s growth and resiliency while Stonecrest, Georgia, offered to change its name to Amazon. Where’s the Best Real Estate and Tech Talent? Atlanta is pitching several sites including real estate along the Atlanta Beltline, GID’s High Street site in the Central Perimeter, the Gulch in downtown Atlanta, Integral Development’s Assembly Project, the former GM plant in Doraville and the redevelopment of Fort McPherson. Boston has proposed its Seaport neighborhood as the Amazon HQ2 site and has committed to building a $100 million cable-operated gondola system to shuttle Amazon employees to work. Brooklyn real estate developers are highlighting their neighborhood’s tech talent and proposing Industry City, a massive complex of former industrial buildings, for the project, which will eventually need to be 8 million square feet. In the Midwest, Chicago’s Old Main Post Office is currently the largest redevelopment in the U.S. at 2.8 million square feet and offers 250,000 square foot floor plates just steps from the Loop. Here’s more on that Amazon proposal. 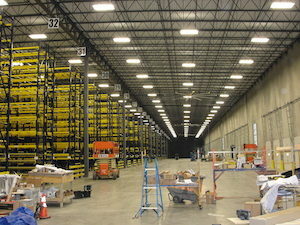 And, if the U.S. sites are not the answer, Amazon can always go a little north. Teaming up with its Canadian neighbor, Windsor, Ontario could mean an international headquarters in Detroit. 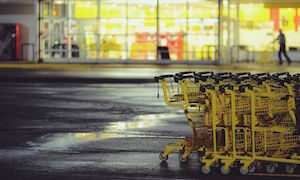 Which city the internet retail giant will choose will remain a mystery for a while longer, but the promise of such a major real estate development has brought out each city’s competitive side over the past several months. 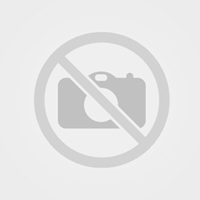 The commercial real estate industry has been on a strong cycle for several years. The big question is: How long will it continue? The latest Emerging Trends Report by PWC (PricewaterhouseCoopers) and the Urban Land Institute, has the long view on the market. Here’s the latest. The Strong Investment Sectors for 2017? 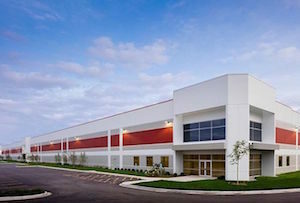 Supply chain and e-commerce growth continues to drive Industrial real estate leasing and investment. Industrial — continues to top the charts, due to the growth in e-commerce and the general supply chain. Well located, institutional quality distribution space has been in short supply for several years across the country. While new construction has been strong, it will take time to lease and sell the buildings and, thus, fill all the demand. Bottom line: investors like the stability and long-term growth of this sector and will continue to seek strong assets in primary, secondary and even outlying markets. Senior Housing/Retirement Homes — these will continue to be in favor, due to the aging population and need for community residences and related services. Urban Mixed-Use Developments — these vibrant, urban developments that combines residential, retail, offices and more continue to draw Millennials and Baby Boomers alike — and should guide development going into 2017 and beyond. More stability in market cycles — Look for less volatility, as lessons learned from the global financial meltdown will guide decisions moving forward. While construction still lags during this post-recession era, it should continue at a tempered pace. Multi-Use– or “Optionality” is in — the trend toward developers and investors seeking flexible, multi-use projects. In this commercial real estate market, buildings that can be adjusted to satisfy multiple tenants and changing neighborhoods are ideal. It lets owners maximize rents and seek the highest and best use. Construction costs to rise due to labor issues — Workers who left during the recession have been slow to return, slowing production and increasing costs. With vacancy rates at record lows in many markets, construction has been a big factor in filling long-term demand. Without an adequate number of workers, costs will rise. Cap rates could go lower in 2017 — As investors continue to chase deals and limited supply and tempered construction present continued challenges. 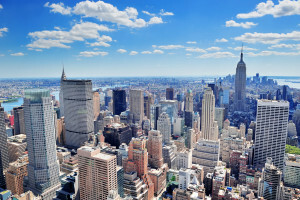 What’s Behind Manhattan Land Sales Slowdown? 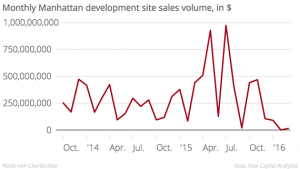 According to The Real Deal, Manhattan land sales slowed during the first part of 2016. Data and analytics firm Real Capital Analytics (RCA) shows that there were only $90 million worth of development deals in January and zero on record in February. What’s going on? Looks like three main factors are at play–stringent financing, lackluster luxury condo sales and the termination of the 421a tax abatement program. 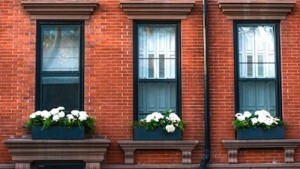 Another key factor is that buyers are not willing to pay the high prices sellers are touting. This is having a ripply effect on development sites. Click here for more. Nearly every day, we hear news of a new high-end apartment complex being built in a major metropolitan area. But new construction with lots of amenities is not what every renter is looking for, says David Schwartz, CEO and co-chairman of Waterton. His investment firm has spent much of the last few years looking for Class B and Class C value-add apartment properties, and renovating them for middle-income renters seeking affordable housing. Industry experts see more of this from private investors on the horizon. One current project for Waterton is the Vida Hollywood, a 25-year-old apartment complex in Hollywood, California. The company is renovating its 345 units, but rents in the building will still remain about $800 less than they would be at a Class-A building in the same area. Barbara Byrne Denham, an economist with New York City research firm Reis, Inc., urges redevelopers not to interfere with Class B and Class C apartment buildings that are already fully occupied. In areas with high job growth and salaries to match, the existing renters might pay the higher prices to live in the renovated building. But in areas where people are just staying stable in their careers, the tenants looking for affordable housing might move out. What should they do instead? And, what are investors chasing? Click here for more. Origin Investments and Randolph Street Realty Capital hit it big for investors this week with the $35 million sale of Lux24, a 73-unit condominium project they repositioned after the condo meltdown. The JV purchased the project out of bankruptcy in 2013, after its original developers ran into financial troubles. 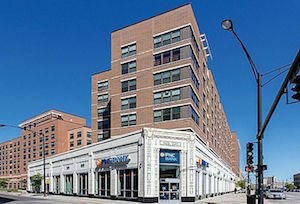 With a $19 million total investment, the team converted the property at 24 S. Morgan into a rental building, tapping into the hot downtown apartment market and the West Loop’s revitalization. As reported in Crain’s, the team invested about $2.3 million to finish construction, reconfigure unfinished units, and move the fitness center. 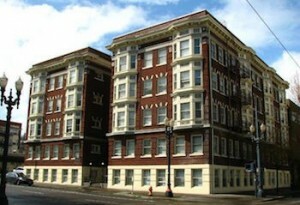 They also bought back a few condos that had been sold and leased up the ground floor retail space.